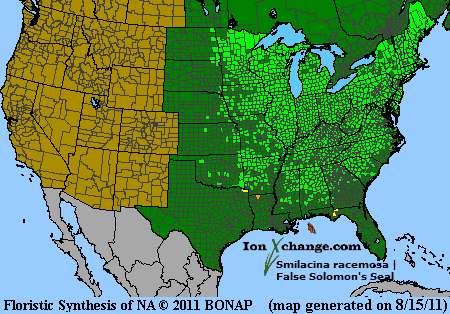 Click the button below to add the SMILACINA RACEMOSA | False Solomon's Seal to your wish list. "False Solomon's Seal, Golden Seal, Job's Tears, Solomon's Plume, Treacle Berry, Wild Spikenard, Zigzag"
Found throughout the northern area of the Tallgrass biome in cool woodlands with a lot of moisture. Creamy, star-shaped flowers bloom from May to July. Long leaves with very short petioles, they can reach 3 feet in height. The ruby-red berries that appear after the flowers are gone are completely edible with a bittersweet taste similar to molasses or treacle (one of the common names for this plant comes from that). The plant also served early settlers well in serving as a treatment for headaches and sore throats. They occasinally referred to the fruit as "scurvy berries" and probably ate it during lean times to ward off that disease. In some parts of the country, the young shoots were eaten like asparagus. Pioneer folk medicine also claimed this plant could be used to treat human plague and hog cholera. Edible Uses: Fruit - raw, cooked or made into jellies and molasses The fruit is smaller than a pea but is produced in quite large terminal clusters on the plant and so is easy to harvest. It has a delicious bitter-sweet flavour, suggesting bitter molasses. The fruit is said to store well, it certainly hangs well on the plants and we have picked very delicious fruits in late October. Rich in vitamins, the fruit has been used to prevent scurvy. Some caution is advised since the raw fruit is said to be laxative in large quantities, though this is only if you are not used to eating this fruit. Thorough cooking removes much of this laxative element. Young leaves - raw or cooked. The young shoots, as they emerge in spring, can be cooked and used as an asparagus substitute. Root - cooked. It should be soaked in alkaline water first to get rid of a disagreeable taste. It can be eaten like potatoes or pickled. Medicinal Uses: False spikenard was widely employed by several native North American Indian tribes who used it to treat a variety of complaints. It is little, if at all, used in modern herbalism. The plant is contraceptive and haemostatic. A decoction is used in the treatment of coughs and the spitting up of blood. Half a cup of leaf tea drunk daily for a week by a woman is said to prevent conception a poultice of the crushed fresh leaves is applied to bleeding cuts. A tea made from the roots is drunk to regulate menstrual disorders. The root is analgesic, antirheumatic, appetizer, blood purifier, cathartic and tonic. A decoction is said to be a very strong medicine, it is used for treating rheumatism and kidney problems and, when taken several times a day it has been used successfully in treating cancer and heart complaints. The fumes from a burning root have been inhaled to treat headaches and general body pain. The fumes have also been used to restore an unconscious patient and to bring an insane person back to normal. The dried powdered root has been used in treating wounds. A poultice of the root has been applied to the severed umbilical cord of a child in order to speed the healing process and is also used to treat cuts, swellings etc. A cold infusion of the root is used as a wash for sore eyes. Other Uses: Plants can be grown as a ground cover when planted about 45cm apart each way.